Rojina’s neighbour, Selina, who is part of a water and sanitation committee that Habitat for Humanity has organised in Northern Bangladesh, informed Rojina of a low-interest micro-loan that they could use to build a new toilet. With the support of the Australian Aid program through the Civil Society WASH Fund and our local partners in Bangladesh, Rojina and her family were able to build themselves a new toilet in February this year. 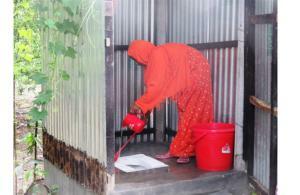 In addition, she received further training on safe hygiene practices which she was able to pass on to the rest of her family. With your support, we have been able to impact Rojina’s family and many others in Northern Bangladesh. This postcard was originally published on the Habitat for Humanity Australia website.